HubSpot vs Salesforce is a complex question to answer. In this post we’ll examine both HubSpot and Salesforce and bring you one step closer to selecting the CRM that’s right for you. Customers are the core of your business. In order to operate a successful company, you need a reliable CRM that fits both your business’ needs and your clients’ needs. Customer Relationship Management helps identify and close leads while simultaneously maintaining and assisting your existing customers. CRM technologies lead to better business strategies and a higher level of functionality in terms of sales, marketing, customer service, and more. We understand the importance of choosing the right CRM for your business. Although it’s clear that integrating CRM software into a business plan is necessary for most growing companies, finding the right CRM is not as easy. Should you go with HubSpot or Salesforce? It’s important to choose a CRM based on your business’ needs rather than solely big names and ratings. This can include evaluating inbound vs outbound sales and tools that can help your business best accomplish its goals. In this post we’ll examine HubSpot vs Salesforce, and bring you one step closer to selecting the CRM that’s right for you. HubSpot was founded on the idea of inbound marketing strategy. Their technologies feature sales, marketing, and service systems, all of which are tied together through their CRM software. HubSpot’s foundation revolves around being helpful, human, and holistic. Their tools are designed to make each step of your journey personal and simple. HubSpot includes a variety of features that users can access. HubSpot’s main softwares include a marketing hub, sales hub, and service hub. The benefits of each of these platforms can be integrated through the HubSpot Growth Stack. HubSpot’s CRM is at the core of it’s software, allowing you to operate all of these technologies together in a way that is easy and efficient. HubSpot CRM organizes and tracks your leads and customers. One of the major advantages that separates Hubspot’s CRM from other companies is it’s price - it’s free. For no cost, you have up to 1,000,000 contacts in addition to users and storage. Although HubSpot also offers premium features, their free software is a great option for businesses that are just getting started and may have a tighter budget. Many of the HubSpot CRM features involve automation so that salespeople focus on selling rather than inputting data. This will save you time and give you the opportunity to close more deals and as a result increase profits. Their software saves customer interactions and logs sales activity automatically on various platforms. Additionally, when used with the sales hub, HubSpot will sync with Gmail or Outlook and track calls, emails, and meetings. HubSpot’s Interface is clean and simple, making it easier to find and access whatever it is you’re looking for. The CRM dashboard displays your entire sales funnel and is updated by the minute, giving you a real time look into your progress. You can sort and filter your deals according to your preference, and easily access deals won and lost, contracts in any state, and upcoming appointments to easily see your company’s current performance in comparison to your overall goals. Additionally, every interaction that you have with a lead or customer is stored in one easily accessible place in the form of a timeline so that you can quickly sort through emails, calls, notes, and meetings. When your business is ready, take HubSpot CRM to the next level by syncing it with the HubSpot sales software. This integration will let you and your team fully personalize your approach towards sales, leading to better, long-term customer relationships. The sales hub provides email tracking, meeting scheduling, and email automation. In terms of email, you can schedule personalized sequences so that you reach leads at the right time. HubSpot’s tracking features and real-time notifications give you insights into which emails are successful based on their open and click rate. Once these emails are identified, quickly turn them into templates for future use. While using the CRM, you also can place calls efficiently and simplify meeting scheduling. Call with just a click directly from HubSpot and opt to record a call based on the information discussed. After the call is over, HubSpot will automatically log it to the corresponding contact. If you need to schedule a meeting, leads and customers will be able to see your availability through a shareable link with your calendar. Each of these features makes the sales process easier and more efficient for everyone involved. HubSpot’s tools, especially when combined, take your business to the next level. In addition to their CRM and sales software, HubSpot also offers marketing and service technologies that will fully integrate their software into your business strategy. Their marketing hub offers a variety of services including lead generation, marketing automation, and analytics. In terms of service, HubSpot creates a direct connection to your customers through various features including tickets, customer feedback, and a knowledge base. HubSpot’s marketing software is an all-in-one technology built to bring customers directly to your business. The marketing hub is designed to help you attract more visitors, convert leads, close deals, and delight customers. With HubSpot, you’ll be able to create a responsive webpage filled with the content that consumers crave. The content strategy tool will find key information so that you can post about topics that your customers are already searching for. HubSpot then takes this to the next level through blog post blueprint and SEO, allowing you to reach and hold onto the right people. Once on your website, visitors will be much more likely to convert as a result of HubSpot’s landing pages, call-to-actions, and lead management software. After a lead subscribes to your email list, deliver personal follow up through marketing automation, CRM and salesforce sync. With all of these features in addition to social media monitoring, your current customers will turn into your biggest advocates. HubSpot’s content management system integrates all of your marketing tools into one, powerful, accessible, and personalized website. With this technology, you can create and track emails, pages, and blog posts in one place. HubSpot automatically optimizes your content for any platform so that it is safe, secure, and fast. From there, you will be able to see who is visiting your page and where they’re accessing it from through the CMS’ smart content insights. This creates a more personalized experience for every potential customer. Through a combination of marketing automation, lead management, analytics, and SEO, you will be able to streamline your content in a way that appeals to the people you want to reach. Once you’ve converted leads into customers, the HubSpot sales software helps you to manage and attend to your existing clients in order to better grow your business. The informed customer has high expectations. As a result, your business needs to continue delivering value to them long after you’ve closed the deal. With live chat features, you can answer your customers immediately. If their problem is more complicated, assign a ticket to one of your team members. Either way, HubSpot automatically logs this information in their customer profile as a result of the integrated CRM software. You can also increase your efficiency by adding chatbots, a help desk, and a relevant FAQ page, while still remaining personally involved. HubSpot also wants customers to be able to help themselves. FAQ pages based on questions that clients have actually asked in addition to the HubSpot Academy and HubSpot Community will cause your customers to grow with your business. Once you’ve made these improvements, use HubSpot’s feedback tools to see the overall impacts of implementing this layer of customer service. Salesforce identifies itself as the world’s #1 CRM platform. Salesforce CRM was the first of its kind, and changed the way that businesses operate. Like other CRM softwares, Salesforce was built to take your business to the next level. Salesforce strives to make advantaged technologies more accessible to everyone, creating better opportunities for growing companies. Salesforce was founded on the characteristics of trust, customer success, innovation and equality. From a software perspective, Salesforce operates on cloud-based applications for sales, service, marketing, and more. Similar to HubSpot, their all-in-one CRM platform is designed to log, manage, and analyze customer activity simply. Salesforce’s three most comparable features to HubSpot are their sales hub, marketing hub, and service hub. These softwares are cloud based and aim to personalize the customer experience by taking advantage of the best developments and technological advancements such as automation and artificial intelligence. Salesforce embraces change and uses technology to transform businesses. Salesforce’s sales strategy involves closing more deals, obtaining leads, accelerating productivity, and making insightful decisions. To accomplish this, they’ve created services for contact, opportunity, and lead management. The contact feature gives you all of the information you need about a customer in addition to insights from various social media outlets. They take a similar approach to opportunity management by providing a complete view of products, competition, and quotes. In terms of leads, Salesforce CRM improves conversion rates and increases revenue as a result. Their sales software combined with their sales data and forecasting lets you to track your leads throughout every step of the process, allowing you to make insightful, informed decisions. Salesforce aims to take a more personal approach to sales. With their sales software, you can make better decisions about clients by using their 360 degree view of the customer. Additionally, this technology tailors any sales process to your preference, making it easier and more accessible for both representatives and partners. Salesforce also takes advantage of frequent advances and innovation by offering the latest technology including automation and artificial intelligence. “Salesforce Einstein” integrates AI directly into your sales process, giving you insights into top leads and potential next steps. Salesforce CPQ takes automating to the next level by computerizing your configure, price, and quote process. All of these features fit a flexible, moving schedule as a result of their AppExchange applications, sync and share files, and visual workflow approvals. Whether you’re in the office on your laptop or on the go with your phone, you still have the opportunity to make a sale. Additionally, all of their software is protected and up to date with the standards and requirements of highly regulated industries. Each of these features come together to create a more consistent process by connecting every element of the buyer’s journey and making your business more efficient. The service cloud was designed to increase customer satisfaction and build lasting relationships through personalized, intelligent support. Their software lets you to communicate with customers through whichever platform they prefer, whether that’s via phone, text, or chat. The connect CRM feature gives you a detailed overview of everything you need to know about a customer so that you can speak directly to their needs. Salesforce’s various AI tools and automated features ensure that technicians have exactly what they need to solve complex customer problems. The service cloud matches customers with agents who are the most qualified in that specific problem area. CTI integrations instantly log information about customer calls while automating repetitive tasks relating to customer problems to save you time. Clients also have the opportunity to answer their own questions through an easily accessible knowledge portal. With this self service feature, easily build your brand through customization of your community branch. You can also directly connect the self service portal with the Salesforce platform, creating a more streamlined experience for your clients. All of these systems were built with the purpose of creating more personalized and efficient way of doing business. Salesforce’s unified marketing cloud creates customer engagement through every step of their experience. This marketing platform offers various studios including email, data, advertising, mobile, and interaction studios. The advertising studio uses CRM data to attract customers through advertisements while the mobile, social, and interactive studios manage customer experiences by reaching them on various platforms at the right time. The Salesforce data studio and data management platform capture information and use that to power your marketing campaigns. Their marketing software also integrates marketing and sales for B2B marketing automation. The Journey Builder is a feature specifically designed to increase personalization. The system connects various customer interactions across different platforms in one place. The Journey Builder listens for customer cues, connects their overall experience, adapts to different customers, and discovers distributed marketing. The system notifies you when customers take key actions, personalizing their experience and adjusting based on the way they change. Journey mapping lays out specific consumer paths for reference so that you can deliver customers with the relevant information they need. The system also involves various departments, giving consumers a more well-rounded experience. The Journey Builder gives you a way to connect with customers on a deeper level. One of the main differences between HubSpot and Salesforce is the number of additional features and platforms that Salesforce offers. In addition to sales, marketing, and service clouds, they also created commerce, communities, collaboration, industries, integration, and platform clouds. Each of these comes with their own additional features and benefits. Similar to their sales, marketing, and service systems, these platforms are cloud based and meant to further elevate your business with the all-in-one approach. The industries feature includes financial, health care, government, and philanthropic services, while the platform feature helps develop and integrate various applications. From commerce to collaboration, these services take your company to the next level. Salesforce and HubSpot ultimately take very similar approaches when it comes to CRM software. They both aim to personalize the consumer experience by adding constant and consistent value through an all-in-one, seamless platform. HubSpot takes a more simplified and clean approach while Salesforce is seems to cover every potential need your business may have. HubSpot and Salesforce both understand the necessity of personal client connection and provide you with the software you need to accomplish your customer centric goals. Choosing the right CRM depends on the way your specific business operates. Every company is different, and the CRM that works for your main competitor may not necessarily work for you. Some areas of the decision making process should take personal preference into account - which interface do you find more user-friendly in terms of operation? Other factors to consider include the features themselves - which platforms will be most beneficial to your company? Which services will you realistically need and actually use? One of the major factors involved in choosing the right CRM is ultimately the price. You need to find a CRM that helps you reach your goals, but to achieve that you have to work with a company that fits your budget. HubSpot offers free CRM features which can be great for smaller businesses, but should also be seen as a short term solution rather than a long term plan. In order to take advantage of all that HubSpot has to offer, you eventually have to invest in their software. HubSpot CRM and Salesforce are similarly billed monthly, but Salesforce charges an additional fee for each user login. Each company offers additional add-ons that can be purchased at a fee. HubSpot and Salesforce both offer free trials if you want to experience some of their features first hand. It’s important to understand all of these costs and how they will change based on your business’ size and needs. To obtain a more in depth understanding of pricing and receive a personalized quote, visit each of their websites or talk to one of their representatives. Understanding all of these technical factors is key to choosing the right CRM for you business. However, you also need to consider your own career objectives throughout this process. What are the core values of your business and which company most similarly aligns with them? Which company is going to help you achieve your specific goals? Ultimately, choosing a CRM will depend on your business’ size, budget, and overall preferences. In this CRM showdown, research is a key element of this process and will ensure that you understand the pros and cons of each company. 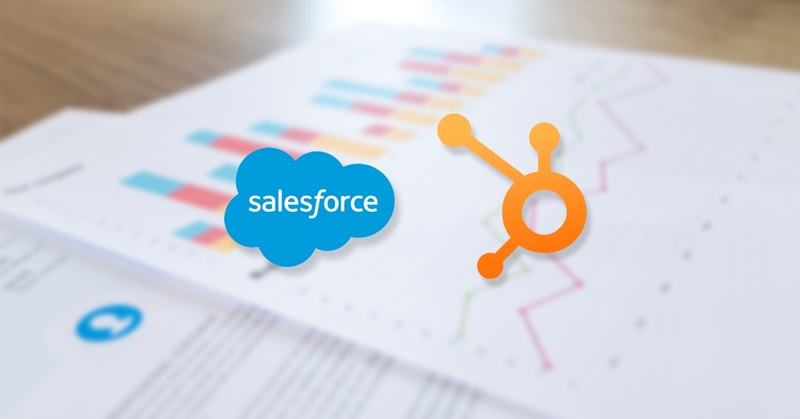 When comparing HubSpot CRM vs Salesforce, the right option will increase your business’ growth by giving you a better understanding of your customers and providing you with the tools you need to succeed. Questions about CRMs? Contact us using the button below to get in touch with our sales enablement experts.